We offer two different awards for those that have Morgan horses. You do not have to show your horse to earn points towards the awards. There are divisions for those that do not show but participate in different events with their Morgans and promote the breed. The SSMHA High Point Award is geared towards those that show their Morgans at Morgan breed shows while the Ambassador is geared towards those that promote the breed at all breed events. For each placing and/or participation there is a set number of points awarded. The nomination for these awards is per horse and rider combination with the awards being given at the banquet which typically happens in February. We encourage any and all youth and amateurs to participate in these as they are another way for us to promote our breed to the world. 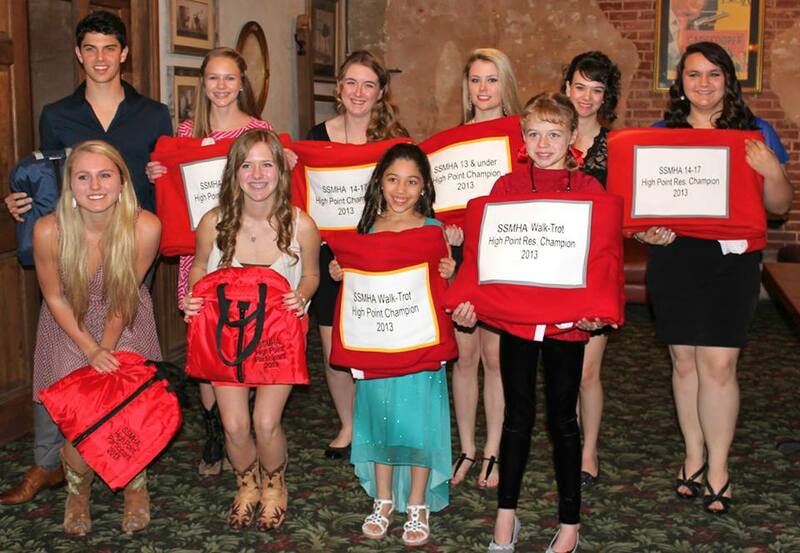 SSMHA High Point award recipients and participants for the 2013 show season! Ambassador award recipients for the 2013 show season.